Welcome to the Halloween Origami Page! I've managed to find some great halloween origami videos from all around the world - people are getting into the celebrations by making some really great decorations! See below for an easy origami bat, a fun jack-o-lantern and a more challenging (but absolutely adorable) origami cat! This halloween bat is one of the easiest and best origami bats I've seen - many bats can be very over-complicated and confusing, but this one is simple and looks so great! 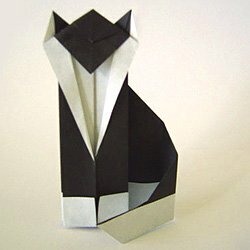 Here's my very own design of an Origami Cat! It's exclusive to Origami-Fun.com, so I hope you like it!